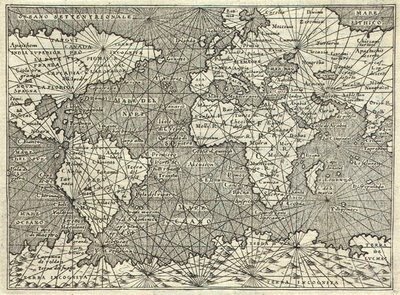 My best hypothesis is that the lines may be related to Rhumb lines and therefore Mercator projections. The lines themselves (Contemporaneously called rhumblines, but that term has since been redefined for modern usage.) are today termed windrose (or bearing) lines: lines of constant (observed) bearing between points. The link describes the significant behaviour difference between windrose lines and geodesics: the latter require latitude determination while the former do not. Before the invention of modern navigational chronometers in the mid-18th century it was impossible to sail geodesics, but quite possible to sail windroses; at the cost of a somewhat longer route. 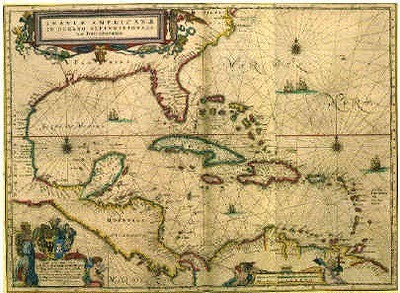 It is called a portolan chart. The lines have no navigational purpose. They were used to copy the chart. The same pattern of lines is drawn on the copy as on the master and then the copyist draws the coastlines using the individual cells of the grid as a reference. For example, in the first chart you give, the lines are formed by drawing a great circle and then dividing it into 16 parts, each point on the circle being a node. Then lines are drawn between each of the nodes so there are a total of 16 x 15 = 240 lines altogether. The same thing is done on the copy. (Note that the copy can be done on a parchment of a different size than the master.) Thus, each chart will have the exact same pattern of lines. The coastlines and towns are then drawn with reference to the cells made by the lines. Because each cell has a unique shape there is no chance of accidentally copying the contents of one cell to the wrong one, as would be the case if you used a grid having all cells the same shape.